The problem with the dramatic staging of photojournalism: what is the real issue? Ruben Salvadori’s video – “an auto-critical photo essay” – demonstrates clearly that when we see a conflict, what we see is the outcome of “conflict image production.” It’s like those still photographs which reveal photographers at work – Paul Lowe’s 1992 photograph of the Somalia famine victim, Alex Webb’s 1994 picture of photographer’s in advance of US troops landing in Haiti (Magnum reference PAR112713), Nathan Webber’s image of photographers with the dead Fabienne Cherisma, and many other examples. These all demonstrate that photographs are neither mirrors nor windows offering untrammelled access to events. Events come to be through technologies of visualisation, and that is a process in which all participants in the visual economy (subjects, image makers, news agencies, media networks, audiences, and others) have a role in the construction of people and places. The difficult conclusion from this is that all photography is staged. But, as I’ve argued previously, staging is not the same as faking. Photography records events in front of the camera faithfully. 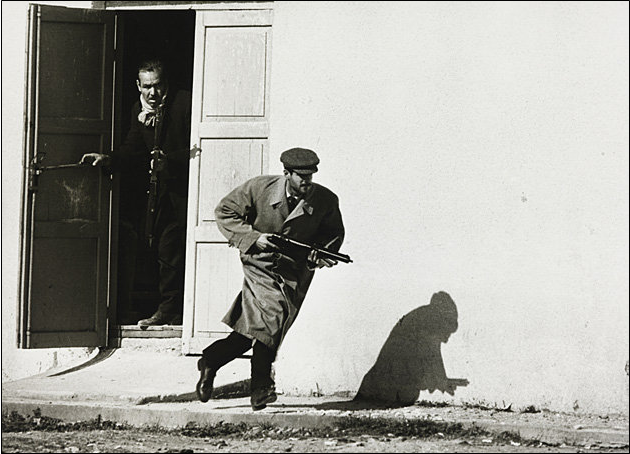 However, events are often photo opportunities in which politics becomes theatre, and photographers emphasise the dramatic. And if you look at the examples offered by the Italian digital lab 10b Photography, we can appreciate that aesthetic dramatisation has long been, and continues to be, part of the most respected photojournalism. When these stagings produce or reinforce stereotypes, they are a big problem (as duckrabbit rightly argued in their take on Salvadori’s video). But photography’s dramatic stagings are not the main problem. I believe that avoiding or challenging stereotypes necessitates changing the terms of the debate. Here’s a fascinating video in which Italian photographer Ruben Salvadori demonstrates how dishonest many conflict photographs are. Salvadori spent a significant amount of time in East Jerusalem, studying the role photojournalists play in what the world sees. By turning his camera on the photographers themselves, he shows how photojournalists often influence the events they’re supposed to document objectively, and how photographers are often pushed to seek and create drama even in situations that lack it (emphasis added). Salvadori’s video is certainly revealing, but “eye-opening” suggests a level of surprise that few in photography should have. It reinforces the idea that what we see in this case are a few bad apples who are failing to be “objective”. There is much that needs to be said about the claim of objectivity with regard to photography, and I hope to write more later. But how could a photojournalist in the scene Salvadori films not influence events? The presence of a camera changes the dynamics of any situation regardless of the intentions of the photographer. Indeed, any scene is changed by the presence of any participants, so the idea that you can imagine a scene that is hermetically sealed from those in and around it is naive. If scenes are to be witnessed, then witnesses will inevitably ‘contaminate’ the scene. And what would an “objective” photo of this scene look like? I can imagine many different images from those moments, but can you conceive of any that aren’t constructed? Surely it’s time to drop the pretence of shock when photography’s constructed-ness is exposed. If we constantly view the essential nature of photographic practice – that it inescapably and unavoidably constructs, enacts, and produces images – as always exceptional and sometimes perverse, we are missing the main problem. That is, how, within a practice that necessarily constructs the world, can we produce authoritative accounts of events and issues? I suspect many might read this and misunderstand the point I am struggling to make. I am not defending the conflict photographers portrayed in Salvadori’s important video essay. Their images are dramatised, though in ways common to conflict photojournalism. Nor am I arguing the images they produce are the best of that scene. Finally, I am not minimising the problems caused by dramatic stagings that turn into one-dimensional stereotypes. Above all else, I want to argue that its ultimately self-defeating for photographers to be outraged by the idea that photographs construct situations. Let’s judge how pictures produce narratives, and the effects of those narratives, instead of being hung up on the fact narratives are produced. If we are constantly bogged down in the unfounded belief that somehow there is a photography unencumbered by the problems of representation, we will never move the debate on visual enactment forward. It’s also the wrong conclusion. At least you’re in good company: Morris is wrong too. I haven’t read Morris’ book – although I’d like to – and you make some interesting points, many of which I’d agree with. But daft generalisations like that simply undermine, rather than reinforce, your case. It’s just not true that all photographs are posed/staged. Trust me on this: I’m a photographer. Good of you to disagree with Morris without reading the book Jeremy. So here’s the challenge for you – show me a photograph that isn’t the result of a process of construction or production, which doesn’t involve a practice of representation. That’s what staged means – constructed, produced, represented. Not faked. As clear above. Looking forward to the example(s). Cheap shot David, and a very inaccurate one. I was being transparent in saying I haven’t read Morris’ book, and I didn’t say the entire book is wrong. I was very obviously referring to the quote “all photographs are posed” that you use to support your case. Assuming the quote isn’t taken wildly out of context, Morris is simply wrong: I’ll prove so in a moment. In the context of photography I think most people would have little difficulty understanding M-W’s meaning. Here are just three examples. There was no interaction between myself and the subjects, at least before the photographs were taken; in fact the subjects aren’t even aware there’s another person present, still less a camera. I didn’t add or remove any objects to the frame. They’re scenes that I simply stumbled across: anyone else present would have seen exactly the same as I, so in a sense they’re snapshots. Now tell me in what sense they have been staged or posed. Where is the process of construction and production? In Pictures On A Page Harold Evans wrote that McCullin worried that it looked like a feature film frame. My point is that just because an image may appear staged to the viewer, even if that viewer is the creator, it does not necessarily follow that it is staged. Jeremy – if people haven’t read arguments in their entirety, they shouldn’t offer sweeping denunciations of those arguments, even in their abbreviated form. I think your transparent admission should have at least tempered your dismissal of Morris, because the tweets summarise the book. Exactly – “to produce or cause to happen for public view.” Sounds like an excellent understanding of photographic practice to me. So, on the one hand you accept that all photographs are a process of representation, but you then want to say that are not the result of a process of construction and production. I have clearly stated in my argument that I view construction and production as elements of, even synonymous with, the process of representation. I’ve stressed that in my argument to stage does not mean to fake (what your dictionary definition calls “deliberate staging”). Even in the Salvadori video that prompted this post, there is no suggestion that the conflict news photographers in Jerusalem were faking the scene. The Palestinians were there doing what they were photographed doing, and happy to be pictured. The video is all about the shots the photographers select, the angles they use, the elements in their composition and some of the (legitimate) post-production techniques. And that is what is most interesting to me about he Salvadori video. Some people have been outraged at what it shows, yet it presents nothing other than photographers in those circumstances doing what photographers have to do (and have done for a very long while) to make what the market thinks is a compelling image. Because of this, my post is not a critique of photojournalism and photographers. It is a critique of the the debate about photojournalism and photography that emerges each time we are supposed to be shocked when its constructed-ness is revealed. This pre-occupation has become self-defeating in my view. None of these photographs, or any photographs, come to be images other than by the actions of a photographer. They are all the products of an encounter, even if your subjects were not immediately aware of being pictured. Without a series of choices that takes a photographer to a place, followed by decisions about the subject, equipment, composition, lighting, post-production and distribution, they would not exist. That seems to me a self-evident description of the photographic process, and I’m always surprised when people are shocked by its exposure and want to resist it. David – please stop flogging that dead horse, it’s painful to watch. I haven’t offered any sweeping denunciations of Morris’s arguments because none have been presented; all you’ve offered are some of his conclusions, but without his supporting arguments. I’ve already stated clearly that it is simply one of those conclusions that I disagree with, not a book that I volunteered I haven’t read, so I don’t understand why you persist in pretending otherwise. Shocked? You can’t be serious. There’s nothing to resist here because there’s no great “exposure” as you put it. What you describe is a series of events and decisions, some of which may be quite random, or even automated, and along the way a photograph is produced. I can’t imagine that very many people would agree with you that such a series of events and decisions in themselves constitute the staging of any resultant image. And no, I’m no confusing “staging” and “faking”: I can tell the difference. The article title is “The problem with the dramatic staging of photojournalism: what is the real issue?” That provides plenty of material for discussion both of photographic practices and of the structure and nature of debates that address those practices. Unfortunately you do a good job of torpedoing any discussion with your insistence that all photographs are staged. What you think of Errol Morris’s arguments is a minor point here, and I’ll let others decide whether or not writing “Morris is wrong” constitutes a general denunciation. As to the other comments, I’m not really sure what you are arguing now. The dictionary definition you provided of staging fits nicely with the overall point I was making about the condition of the photographic process, but it seems you object to something about the idea of staging, even though you accept it’s different from faking. But I can’t work out what specifically you object to. As for my argument “torpedoing” discussion…well, that’s self-evidently not the case is it. I’ll be as specific as I know how. I object to your assertion: “The difficult conclusion from this is that all photography is staged.” I stress your use of the word “all”. When I first read this I assumed it was just careless hyperbole: you couldn’t possibly mean that every photograph ever taken by anyone under any circumstance was staged. In other words, if a photographer takes any action whatsoever – and he must otherwise there would be no photograph – the resulting photograph is staged. Frankly, that’s an extraordinarily elastic use of the word “staged”, and as I said before I don’t think it’s one most people would recognise. I suggest that most people have a pretty clear idea of what constitutes a staged image, a faked image, and one that is – for want of a better term – natural. I’d be amazed to hear anyone describe any of the samples I sent as staged. In fact I was amazed when you did so; except that if one adopts your rationale above such a conclusion is not only logical, but inevitable. The problem from my point of view is that your rationale is hopelessly flawed. As for torpedoing the discussion, I guess again I need to be more specific. There’s a discussion, but it’s the wrong one: not what I expected and I doubt it’s what you hoped for. I expected a discussion along the lines of the title, instead it’s got distracted because your claim regarding the staging of all photography is far broader then the title implies. So perhaps not torpedoed, but definitely sidetracked into the wilderness. Incidentally the email alert system for your blog doesn’t seem to be working. I’m subscribed to this entry, but I don’t receive an alert when there’s a new comment. as Jeremy points out journalists aren’t going to be able to get beyond the idea that all photography is ‘staged’ because journalistically the term has very specific meaning (very different to faked) and very different to the way that you want to use it. Wouldn’t it make more sense to use a term like ‘constructed’ or even ‘contrived’, then we could get beyond semantic arguments into the real and important point that you are making? I totally agree though with your main point. Ben – although I’ve always argued that staged/constructed/produced are similar, I think this is much more than a semantic issue. Even if it was semantic I doubt very much the likes of Jeremy are going to be happy with ‘contrived’ as an option. Jeremy – final comment. I use stage to point to exactly what the definition you supplied suggested – “to produce or cause to happen for public view.” I can’t comprehend the idea of a “natural” photograph. They aren’t made by acts of nature or divine intervention. Photography is a technology of visualisation – that produces or causes images to happen for public view – and photographs are only made by the interaction of humans and technology. So this discussion has certainly clarified and reinforced my understanding along those lines. I ask only half facetiously (bear with me): What about a photo that was taken accidentally, when you accidentally set the camera off when its pointing at your feet or when its in your bag or something? (We’ve all done it, I’m sure.) Would that photo be ‘staged’? Of course such a picture probably wouldn’t be very good and would hardly qualify as ‘photography’ but I’ve seen weirder things in art galleries and I think it raises a conceptual point that could do with being worked out. If it IS staged then that would imply that the staging at the most basic level occurs either (a) in the design and basic materiality of the camera, which precedes taking the picture, or (b) in the interpretation of the photo after it is taken. It doesn’t seem possible that such a photo could be staged (c) at the moment of taking it if the taking was accidental and no consideration was given to what was being photographed and how (Freudian slips of the finger notwithstanding). Can the camera really compel its user to perform such a particular and complex function just because it is what it is? Perhaps this could be true to an extent but staging is surely more than whatever we could attribute to the unilateral powers of the object itself. The second option would imply something like backwards causation, which I know your occasional interlocutor Colin Wight gets all worked up about. More than that (let’s avoid that discussion!) it would mean that the photographer doesn’t necessarily conduct the staging, which would seem to run counter to your argument. In short: neither of these options seem very acceptable to me so it seems as though such a picture would be, in fact, unstaged, which then begs the question: at what level of intentionality does a photo become staged? Is there a purely ‘accidental’ state which can be clearly bracketed off as an exception to the rule or do all photos, because the photographer never knows just how they’ll turn out (isn’t this the excitement of it all? ), carry an unstaged-ness — an immanence to the unpredictability of the situation — in them? If this is so then it becomes legitimate to discuss the extent to which a photograph was staged, because this extent would be linked to intentionality and preparation, and we should then consider modes of staging, as not all stagings happen in the same way and are not directed towards the same ends. And this is where things like this start to get interesting, philosophically at least, as we move from a quite negative argument ‘nothing isn’t staged’ to a more creative and challenging one ‘things are staged like this and that and the other’. I hope that I’m making at least some sense. I’m just thinking ‘out loud’ really but if I were to state a real opinion it would be: saying that all photographs are staged is not enough without a counterpoint that tries to understand the element of surprise that the photograph always springs upon the photographer, the element that they did not and could never expect or plan for. Otherwise, it just seems like all photographs are equally staged and in the same way, which is a rather dull and homogenising manoeuvre (and I doubt this is what you’re trying to say at all). Isn’t a really good photographer one who lets themselves be surprised by their own photographs, who lets go, who doesn’t try to master the frame but takes the RISK of letting their heart race and their trigger finger do its own thing? Isn’t this why many photographers don’t like digital photography because it eliminates the excitement, the delay in gratification that comes with taking your films home and processing them? If, as with most digital cameras, you can see your picture immediately and discard it as if it was never there then aren’t you mastering the frame by commanding supreme destructive power? The right to immediately ordain the life or death of the photo! Mastery par excellence. With film each photo is given its own unique life, even though most will eventually be discarded somehow. Even if it lives only for a short time each captured moment must be taken seriously. It is precisely because so much in it is NOT staged and can never be staged that this excitement is possible at all. No photo (besides perhaps the blind, accidental one) is purely unstaged, sure; every photo is taken in a certain way due to the photographers training, experience, political or unconscious predispositions, absolutely. But by detracting from the surprise of the event and thereby neglecting most of the many and varied vectors that swarm into the frame quite beyond the control of the photographer aren’t we doing a disservice to photography, even as we make an important political point (which I understand to be: don’t use ‘reality’ or ‘objectivity’ as a crutch; it’s silly and lazy; take responsibility for your clickings, however frenzied and in-the-moment)? I’ll shut up now. Alas, everything begins in politics and ends in mysticism! Perc, the key point in my argument is that there is no photography free from staging (meaning construction, enactment, interpretation, or production). I stick with the idea of staging as shorthand for this because it directs us to the idea of a production making things for public view. It is also the term that people like to use to describe what they see as the perverse exceptions (e.g. the examples I begin the post with). But far from being the exceptions which define a norm, I’m trying to shift the terms of the discussion so that we so those ‘exceptions’ as moments which reveal much about the very condition of photography. Staging involves a whole series of components, decisions and networks, in which humans intersect with technology. In some sense, perhaps, what I am trying to articulate is the ‘meta’ of photography, and certainly the conditions of possibility which make constructed-ness the very being of photography. As such, things like ‘accidents’ and ‘intentions’ take place within this meta condition. Trying to unpack the conditions of possibility does not mean we end up describing an automated machine which determines all things and in which there are no choices or surprises. Objects don’t have unilateral powers to function independently, and photographers, while exercising options that mean they can produce better or worse work, don’t avoid the constructed-ness of their enterprise. In short, in my argument staging is in no way about intentionality – it’s the condition in which and through which intentionality might be practiced. So surprise is not a counterpoint, but a part of the possibilities within constructed-ness. Because of that, we certainly don’t end up with mysticism. The mystical moment is when one ignores the constructed-ness of photography and pretends its somehow a natural process. I think I understand why: I’ve finally realised I’ve had conversations like this before, invariably with political or religious fundamentalists. There’s an article of faith – in your case the belief that all photographs are intrinsically staged – that precludes the existence of any element contrary to that article. Any logic underpinning the article is invisible to unbelievers, but that’s of no disadvantage to the faithful: on the contrary any questioning of the article only serves to bolster the faith of the believer. You’re entitled to your beliefs, but such an approach is a bit restrictive for my tastes. Sorry, did I miss the bit in your comments where you were open to alternative arguments? The comment on ‘mysticism’ was just me being self-deprecating with regard to my own comments (which wandered a way into metaphysics)! It wasn’t a comment on philosophy generally, and certainly not on this discussion altogether. Perhaps I was wrong to set the problem in terms of intentionality, which is a can of worms itself. Is an accidentally taken photo staged? If this is so then I don’t know what staging is. If it is not then either this poses the conceptual problem I outlined above or we can conclude that an accidentally taken photo does not constitute photography and therefore the question is moot. That is probably the simple answer. In this case staging would not refer to the simple act of taking a photo but to photography as a process that involves taking photos as a necessary but not sufficient condition. Of course one can collapse the taking a photo/photography binary if one so wishes but that is true of all distinctions. I hope it is clear that I largely agree with you, however I suppose I am not so keen on the Kantian mode of thought, in one way or another. I don’t want to make construction qua practice logically prior to the elements that are combined in any event of construction. My philosophical predispositions are more towards Latour or Whitehead who would want to address the problem more ‘symmetrically’. Construction is itself a can of worms as it has historically implied an active agent acting on passive materials. If we can talk of tectonic plates constructing mountains or bees constructing flowers, constructing bees then I’d be happy to make construction the meta-condition of photography in the same way that it is for everything. However, if we’re setting up construction as a transcendental condition of human experience that, in one way or another, marks off an ‘outside’ about which nothing can be said except through construction (and if we stop talking at this point) then we remain squarely within the dualist Kantian universe; we remain too much inside the ‘bifurcation of nature’ that Whitehead wanted to escape from. The fact that human experience is necessarily perspectival, constructed, staged or interpretive (etc.) bifurcates nature (and so makes us dualist) if we do not attribute this same contingency, partiality and perspectivity to the relationship between any given thing, human and experiencing or not. To use the old and unhelpful lingo: if interpretation only occurs at the liminal point between subject and object and not object and object then one has thereby produced a duality: subjects immanent to subjects, objects immanent to objects and a gulf inbetween. In short, I want the cognitive, cultural, pragmatic or political predispositions of the photographer (which are all enabling as well as constraining conditions of her photography) and the other conditions of photography (a camera, light, other people or things to photograph, etc.) to be articulated together. Construction or staging as you are describing it seems to necessitate the articulation of one and then the other. Making staging the metacondition of photography only seems to invite the response that a ‘real world out there’ is also a necessary for staging to occur. I’d prefer to preempt that response by bringing all those objects that make up the ‘outside’ inside before that can happen and nature can bifurcate once again. You’ve lost me with your specific philosophical references I’m afraid. But if pushed I would agree that ‘construction’ as a concept has problems, and I would prefer to use the idea of ‘performance’ as a way of approaching the meta condition (hence the connection to staging as a descriptor for that). But in so far as I do grasp your conclusions, I had hoped the argument here made exactly the point in your second last paragraph, although I would reject the implication that bifurcation and duality are consequences of what I am trying to convey. Indeed, they are the reverse of what I would want to posit. Okay, my attempts at philosophy leave something to be desired. However, I’d certainly recommend Latour as an alternative voice on this kind of issue. In fact as a dean at Sciences Po in Paris he has set up a ‘School of Political Arts’, the focus of which is representation in politics, science and art. This is an aspect of things I hadn’t given much thought to. Certainly every photograph is staged as you say, in the sense that the photographer constructs the image, there’s no arguing that point in my opinion. If there are people who are outraged by this idea I have to wonder if they understand the essence of photography which is telling a visual story. You HAVE to stage the story, whether or not you exert influence is completely different, and something I’ve got to think about now. Apparently, you guys, mix the photographic composition (which is always staged – at least when the photograph is taken by a person who knows a thing or two about photography) with the content of a photographic image (which may or may not be staged). Stating that every photograph is staged simply does not make sense and is not true. And mixing the “story” in together with “taking photographs” is just further proof of your confusion and has nothing to do with the point that Ruben Salvadori tried to make. RobD: a curious comment. There’s no mixing, just a recognition that the relationship between image and event is more complex than you grant. I’m also a bit perplexed by the contradiction in your comment. Which do you actually believe – that the photograph is “always staged,” or that saying that makes no sense and is not true? I am of the opinion, one cannot, as an emotional being, take a picture without instilling some emotion to that photograph. If you accidentally snap a picture in your bag or of your feet, you instilled a bit about your emotion or your situation in that moment. You captured a little slice of your life. “I was somewhere else, not thinking about what I was doing and accidentally pressed the shutter button”. However, for documenting a situation like a war, or a potential war, you are obligated to add as little to the scene as humanly possible. A photograph tells a story to its audience, as such, one must tell that story as accurately as possible to the audience because this is real life. People really die. Children really lose their limbs. Houses really fall on sleeping infants when a bomb is dropped on the military building next door. If you consider that the particular photograph adds more to the perceived mood, state, situation, than what is the truth, then it is a lie. You have added to the story. Does any of this support or refuse the subject of all photo’s are staged….I have no idea, and I really don’t much care. I care for what that staging (or lack there of) does to the story being told to the audience who wasn’t there. Photography, how I approach it in my amateurish way, is to try and instill the emotion I felt when I saw that scene, therefor I shall either stage the photograph, or note take it at all because I do not see a way to capture that emotion I am feeling (suppose I am in support of all photographs being “staged”). I think war photographers have become, or they are good photographers, meaning they can capture an emotion. This begs the question, are audiences’ feathers being rustled because of an emotion, or because of a fact. In Ruben’s film, seeing the photograph of the police is dramatic, it paints a picture of turmoil, a country at war, people dying, military intervention is needed. The second picture, the wide long shot, paints a picture of people standing around waiting for something to happen, and playing around with a photographer who wants to take great photo’s. Which of the two photographs is more likely, in context, in terms of the story it tells, the emotion it conveys, to start a war where real people die. Those are my thoughts on the context of war photo’s that fuel news media. Sadly, those photographers can’t eat the second photo (wide long shot), but the dramatic one buys them food for two weeks. Why? News media isn’t about the truth, it is about entertainment. Interesting links David. Interesting discussion.